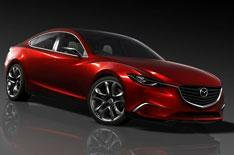 No Mazda 6 rival from Nissan | What Car? Nissan won't return to the traditional family car market any time soon, despite rival Mazda showing the Takeri, a forerunner to the next Mazda 6, and one of the Tokyo motor show's star cars. Nissan's last traditional family car, the Primera, died in 2006. Family car mainstays such as the Ford Mondeo and Vauxhall Insignia are big sellers in the UK and these cars will be joined by the new Mazda 6 in 2013. However, Nissan's executive vice-president, Andy Palmer, dismissed the idea that Nissan should make a traditional family saloon. 'We will be launching 51 new cars over the next five years,' Palmer told What Car?. 'That's a new car every six weeks. We are very satisfied with what we are launching and we will not be following anybody. We will be selling 7.6 million cars a year by 2016. This is the best time in Nissan's history,' he said.